"Canada, in the footsteps of Jacques Cartier" was elected winner of the 2006 prize given by the French Association of Journalists and Writers of Tourism. 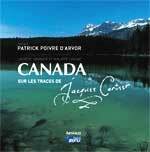 It will be given by Patrick Poivre-D'Arvor and the Ambassador of Canada on March 14, 2006 at 12h15 in the Canadian Cultural Centre in Paris. aventuriers@studionomade.com and we shall forward you an invitation promptly.